The CBT6820 provides twenty bits of high-speed TTL-compatible bus switching. The low on-state resistance of the Switch allows bi-directional connections to be made while adding near-zero propagation delay. The device also precharges the B port to a user-selectable bias voltage (BIASV) to minimize live-insertion noise.The device is organized as two 10-bit Switch with individual enable (OE) input. When OE is low, the Switch is on and port A is connected to port B. When OE is high, the Switch between port A and port B is open and the B port is precharged to BIASV through the equivalent of a 10 kOhm resistor.Special clamp circuitry and Schottky Diode clamps to ground are used to prevent an under voltage on the A side (Vin < GND) from causing the B side precharge voltage to drop below the '1' state. 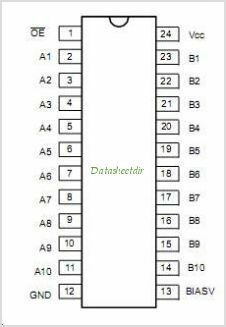 This is one package pinout of CBT6820,If you need more pinouts please download CBT6820's pdf datasheet. CBT6820 circuits will be updated soon..., now you can download the pdf datasheet to check the circuits!